I took my baby swimming without a baby wetsuit and she really felt the cold, would definitely recommend especially for younger babies. Good quality and easy to put on. I would recommend this as water can be cold at the swimming pool even for adults. Being warm in the swim class is the key to a fun successful experience! Recently started using the larger size. Must say that I prefered the open flat design which you get in 0-6 and 6-12 months. However still a good buy and relatively easy to put on. We are making very good progress in the lessons as my baby is always warm and happy to stay in a long time. From a parent's point of view this Konfidence baby wetsuit is easy to spot in the pool and also easy to grip. The Konfidence Baby Swimming Wetsuit allows you and your baby to enjoy the pool more because it keeps your baby warmer for longer. Made from neoprene it is soft to wear and promotes a happier, warmer baby. The Konfidence babywrap wetsuit has a snug fit which encourages the baby to feel safe and more confident in the water. That combined with longer time in the water makes baby swimming less effort and more fun. Perfect for baby swimming lessons and use in the pool with a bottom flap for easy nappy changing. For easy changing, the baby wetsuit folds flat and the simple wraparound design makes it easy to create that snug fit. 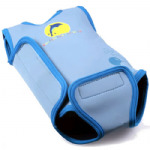 Perfect for baby swimming lessons and use in the pool with a bottom flap for easy nappy changing. 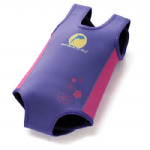 This size baby wetsuit features a pull on design with velcro fastening over the shoulders. Easy to spot in the pool and also easy to grip. Keeps your baby warmer for longer. Makes baby swimming less effort and more fun. 0-6 months & 6-12 months baby wetsuit folds flat with simple wraparound design. 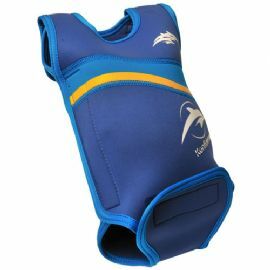 12-24 months features a pull on design with velcro fastening over the shoulders.